At the recently concluded second edition of consumer electronics (CE) tech event ICCE-Asia 2017 organized by IEEE held on October 5-7, in Bangalore, the theme was "Intelligent Living through Smart Technology". After attending the event one thing is clear, Technology convergence is spreading into non-electronics areas too. Its no more electronics, it is electronics in every thing. Television is no more your prime media device, even if it serves as main media entertainer, the future TV is not about a typical broadcasted or one-way telecasted content. Its going to be internet connected smart TV streaming personalized content. Though smart phone emerging as prime device, there are lot more gadgets to stream media - it can be any connected device with ability to stream high-quality audio and video with wireless connectivity. It can be your television, your laptop/notebook computer, your wearable glass, your smart phone, your car, or your gaming console. Now the consumer electronics is more about delivering personalized, immersive, high-resolution, natural feel-like content the consumer wants and wherever the consumer wants. Convergence is now a reality and already spread into complete home and car. Added to the media-streaming consumer-electronics technology, is the fast emerging smart home technologies, and any such IoT powered devices. Your car is a smart-gadget, or a mobile smart home, or a smart phone pocketing you inside. Another most important dimension getting added to the consumer Electronics area is virtual reality (VR) and augmented reality (AR) technologies. It's kind of combination of natural and synthetic content streamed to your retina and other senses through wearables, for fun, learning, assisting complex jobs, military/defence or any visual experiencing and controlling things virtually without going there. This is going to be really cutting edge technology, where the present typical smart phone will change drastically into a mass of physical electronics hardware and a battery bank sitting in your pocket or your hand bag, you communicate with the world with all the natural options available. The most visible trend now in the market is, no more audio jacks in latest iPhone 8 from Apple and pixel from Google. You control the audio through the wireless earphones called buds through your voice and touch, some of them also do langauge translation on the fly in realtime. However taking the display out of the smart phone might take some time, but looks to be the next big step. It's going to be immersive, consumer is fed with entertainment content in most natural way. Guess what is the core technology driving this, its software supported by low power highly integrated silicon and electronics. A 7nm SoC chip packs enough punch for 3D virtual image rendering of mega scale. A move from 14nm to 7nm generates 2x or even more software programming needs. That's the reason why the second consumer electronics event was conducted in Bangalore- India, where there are plenty of consumer electronics related software programming expertise and also semiconductor development. Once the analog content is captured from the sensors such as microphones and camera, they get digitised and further processed with powerful software tools and customised hardware/silicon platforms. The artificial intelligence (AI) tools, machine learning (ML) or deep learning (DL) uses customised silicon to understand audio and video like the way your brain does. It's more vector graphic processing and DSP, far less traditional CPU computing. It's about pattern, colour, shape, frequency, amplitude analysis. AI is all about a machine powered with human cognition capability. ML and DL is now trending a lot in audio visual processing. 3. smart user interface such as voice/speech recognition, visual and gesture. a. There are five voice-enabled smart speaker technologies: Amazon Alexa (Echo), Apple Siri (Homepod), Google voice (Home), Microsoft cortana, Samsung Bixby. The competition is really heating up. How hot! the example is If you're a Amazon Alexa user, you not able to access video from its competitors such as Google YouTube. Amazon Echo leads with 8 billion shipments worldwide. The voice battle has started in consumer electronics space. b. The features driving smart AI speakers include: hands-free, good quality audio, simple looks, always on, and Work as companion. You can control various appliances at home, monitor weather, safety and security of home including locking the house, and also make coffee. 9. A smart home adjusts itself dynamically to the occupant's requirements. 10. The field of virtual reality (VR) and augmented reality (AR) is now called extended reality (XR). XR is still in infancy stage, may take another two/three years for a market impacting product. 11. The challenges in XR includes motion tracking, display technologies, power and thermal issues related to semiconductor chips and the associated electronics, mm scale GPS accuracy, standards, ensuring safety of eye, outdoor usage, and getting lot more natural. Wish all these technologies merge to help the visually challenged person more than anybody else. But for now prepare for another stream of digital sensation hitting your eyes and ears, whether you like it or not. Virtually you can walk naked on your favorite beach, do scuba diving all in your room but need to wear the VR/XR glasses. On positive side, I can attend future ICCE conferences virtually sitting on my office desk and feel and move around as if I am physically present there, saving myself from Bangalore traffic. 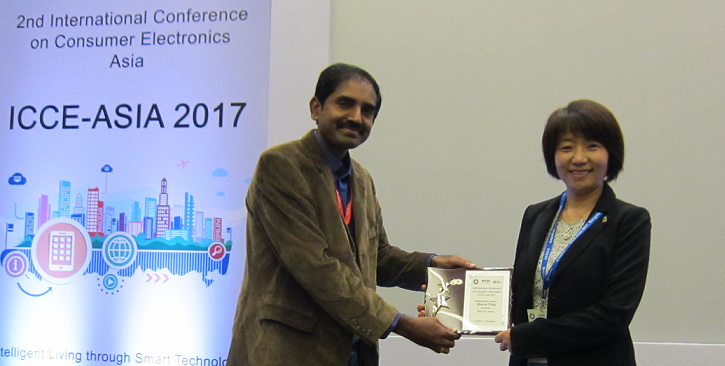 Picture1: Prabindh Sundereson,General Chair of the ICCE-Asia 2017 event committee, presenting a mometo to Dr. Sharon Peng, President of IEEE CE Society. 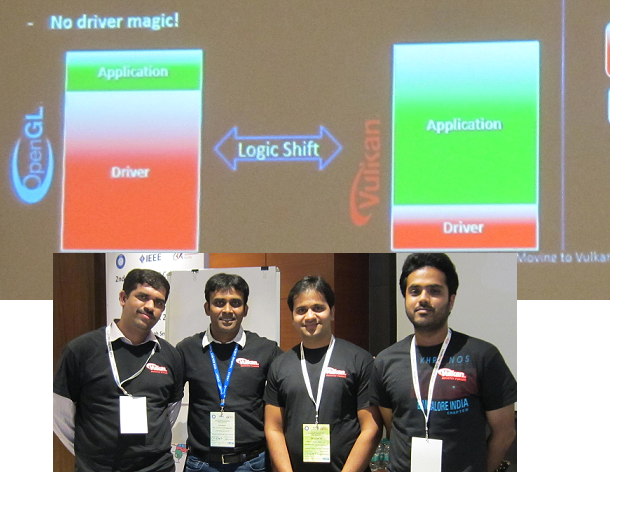 She gave an interesting keynote and instrumental in bringing this event to Bangalore. Picture 2: Khronos team presented a tutorial on Vulkan, a graphic image rendering software standard suggested as an alternate for OpenGL. How 64-bit ARM Processor servers trending? ST's STiH237 powering new Skyworth Digital HD set-top box.